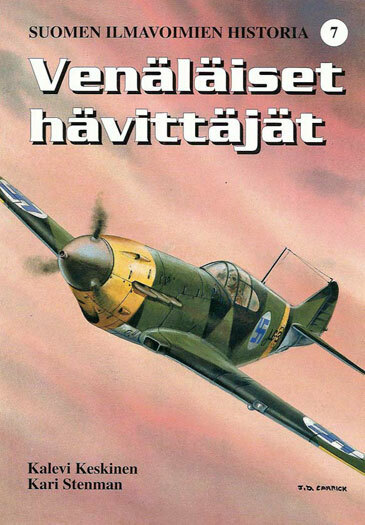 The newest offering in the Finnish Air Force History series from Keri Stenman Publishing covers the Soviet fighters used by the Finnish Air Force during the Winter and Continuation Wars. These were the LaGG-3 and the Polikarpov trio: The I –16 (including the UTI), I-153 and the I-15bis. Finland acquired these aircraft in various ways; from rebuilding flyable aircraft from the remains of aircraft that crash landed, such as the LaGG-3, to actually buying them from the Germans, as was the case with the I-153. These aircraft were not merely relegated to second line reconnaissance or training roles; many were actually used in combat. The LaGG was used to chase down high-speed Russian bombers, and Finnish Chaikas actually engaged Russian Chaikas in a dogfight. This volume is well organized and presents the information in parallel columns in Finnish and English. The authors provide a brief background on the development and procurement of each of the aircraft. The specifications of the aircraft in Finnish service are then given. Finally, the use of each aircraft by various units in the FAF is presented. As is the case with all previous publications in this series, the high quality photographs form the core of this volume. For those who model any of the aircraft discussed, the photos provide a veritable walk around. There are even a few pictures of the underside of the I-153, as nosing over was something it seemed to do quite easily. In the case of the LaGG-3 there are pictures of each of the four Russian aircraft that were reassembled to give the FAF three aircraft. Finally, there are a few good cockpit photos and an excellent picture of the gun sight used in the I-16. There is only one shortcoming in this volume. The “biography” of each individual aircraft is in Finnish only. I wish an English translation had been provided. Even with that one minor drawback, this is an excellent book. Given the few publications there are about the aircraft discussed in this volume, this is indeed a welcome addition and will provide modelers with an excellent photographic reference.